This post is based on an interpretation of a pattern called View-View Model-Document or View-View Model-(Data) Model. I did not invent it. I just write this to have a record of what I learned when exploring the design pattern. The following figure displays the WPF Application Architecture. On the right side a legend explains the meaning of the shapes used in the diagram. The Xaml shape indicates artifacts that are typically created with Xaml. The WPF shape indicates to a WPF specific type and the class shape indicates a custom class specific to the application in question. The dashed lines show a Data Binding dependency with the arrow pointing toward the dependency being bound. The solid line with the arrow also displays a dependency but one that is set on the named property. A solid line with a diamond represents containment (diamond being the container). Multiplicity of this containment is indicated with the numbers at the “containee”. The View Model is set as Content on the View. The ViewModel will provide object instances that drive the View’s content. These instances are usually Data Model types but can also be other view specific types. 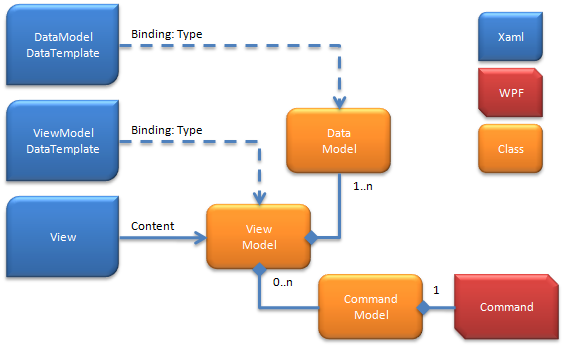 Through the use of Data Templates the ViewModel type and the Data Model type as well as any other types the View Model might provide are “converted into UI elements”. Each Data Template is written specifically for the object type and has knowledge of the object hierarchy within one instance. There are two options in how to interpret the Data Model. Some would consider the Data Model to be the collection of all application data (not necessarily counting view or UI specific data). Others would design a Data Model class to manage only one instance of one entity. A Data Model that is modeled to manage one or more collections of data can be harder than to bind against than a Data Model that manages only one entity instance. Either way can work with this architecture although it must be said that creating a Data Model that only passes through the information of the entity must be avoided. With the View Model and the Data Model in place the View can be data bound and the content is rendered in the View based on the View Model Data Template and the Data Model Data Template. Note: A major drawback of working with Data Templates is the lack of support for Visual Designer Tools (Blend and Visual Studio). These tools will help you design views but not as a Data Template. Just rendering a view is like a glass window: you can see everything but you can’t do anything with it. A user interacts with application by clicking and typing: generating events. This architecture proposes to use Commands to route these events to the application (code). WPF predefines several categories of commands that can (and should) be (re)used in your application. The Command Model manages a command and the event it represents. On one hand it references the Command it manages on the other hand does it reference the View Model. Think of the Command Model as the mini-Controller for one Command. When the Command fires the Command Manager executes its handler code against the View Model, which might cause view updates (property changed notification). During binding in the Data Templates the Command must be set to the Command property of the UI element. Note that Command instances can be declared static. Because the objects are bound to the view (and Data Templates) there is no dependency from the View Model or Data Model to the View or its UI elements. This means that the View Model, Data Model and Command Model objects can be unit tested very easily without having to resort to UI-record & replaying testing tools. My first experiments with this pattern were interesting: it takes a little getting used to and frequently I had to get above the code to see the (helicopter) overview to see what I was doing and were to put the code. I realize that this post might be a bit short and cryptic. I recommend reading the blog posts of Dan Crevier that also includes a sample application in its last post. I think I might have deviated a little from what Dan writes but the idea remains the same: Utilize the tremendous power of WPF data binding.